Our events range from afternoon strolls on rolling hills in the Pentlands to multi-day backpacking in remote wildernesses and to rock-scrambling on the toughest mountains in Scotland. We grade our events to help you find days that suit your ability and fitness. Hikes are categorised from level 1 to 5, with 1 being easy and 5 being suitable for very fit people capable of long hill-days. Our scrambling events are graded from 1 to 3 as defined by the SMC. More information on scrambling grades can be found on our Rock Scrambles definitions page. Type Longish approach which may not be obvious. 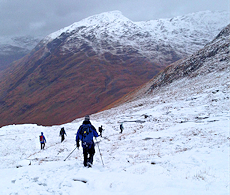 Several steep ascents or descents, some rough terrain (boulderfield, scree or deep heather). Perhaps occasional easy ungraded rock-scrambling. Fitness Good level of fitness and stamina. Must be able to cope with a long day on hills. Type Long approach which may not be obvious. 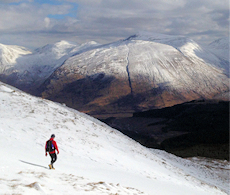 Many steep ascents or descents, lots of rough terrain (boulderfield, scree or deep heather). Ridge walking above exposed drops. Perhaps occasional easy rock-scrambling (almost to Grade 1). Fitness High level of fitness and stamina. Must be able to cope with long days on hills. Type Use of hands occasionally for progress, holds will be large and the exposure not too daunting. Type Significant exposure and use of hands required more often. Experience At least 3 Grade 1 rock-scrambles and are comfortable moving along such terrain. Ideally you'll have been out with us before. Type Some very exposed situations, with moves on steep rock where protection may be required. We treat Grade 3 scrambles as 'Moderate climbs' using ropes and relevant climbing gear. Experience Some Grade 2 rock-scrambles and be comfortable progressing on such terrain. Ideally, you will have been out with us before.